The origin to the legend of the farmer and horse can be traced back to researcher Dale Kaczmarek, President of the Ghost Research Society in Oak Lawn, Illinois. The sighting was first printed within the first edition of the 1982 Ghost Research Society Ghost Trackers Newsletter, as well as televised during a 1982 NBC 5 Chicago broadcast in which Kaczmarek was a guest. Legend states that in the 1870s a farmer and his horse were plowing land when, for some unknown reason, the horse ran into the pond adjacent to the cemetery pulling in both the farmer and plow resulting in their death. The usual theory is that the horse was startled, which in turn caused the calamity. Apparently there were no witnesses around during the incident so it is uncertain as to what truly happened. It is often said that a combination to the weight of the plow and the farmer not knowing how to swim is what lead to his death. During the late 1970s Dale Kaczmarek interviewed a couple of Cook County Forest Preserve officers, also referred to as forest rangers at the time, whom both claim to have witnessed an apparition of a farmer with a horse and plow crossing 143rd street. As the officers were driving east on 143rd Street late at night the apparition came from out of the pond heading north, crossed 143rd Street while rapidly passing in front of their headlights, and disappeared into what is now called the Rubio Woods Forest Preserve. Within the 1989 book True Tales of the Unknown: The Uninvited it mentions that they watched the apparition disappear from view as they approached the Midlothian Turnpike. In the 2005 book Ghost Hunting Illinois, however, it mentions that the officers stopped their car to watch the event unfold. It is said that the officers did not file an official report out of fear of ridicule so the only information to rely on is the testimony of Dale Kaczmarek, whom also happens to be a contributor to the 1989 book True Tales of the Unknown: The Uninvited. As referenced earlier, the 1989 book True Tales of the Unknown: The Uninvited mentions that the apparition came from out of the pond. Found within the 2000 book Windy City Ghosts Kaczmarek states, "As they began to approach the lagoon, they saw what appeared to be a farmer and his horse pulling a old-fashioned plow suddenly materialized in the middle of the road and quickly disappear into nearby Rubio Woods." As a result of the interview with the officers, Kaczmarek recalled a time during his historical research that there was an incident of a farmer and horse drowning in the pond. On page 86 of the 2000 book Windy City Ghosts Kaczmarek states,"Later research indicated that in the 1870s, a farmer and his horse did in fact drown in the lagoon while clearing some land for crops." 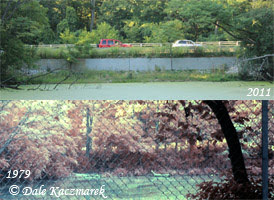 For the sake of clarity, although it mentions a confusing statement of "later research", an interview of Kaczmarek conducted in 2009 indicates that he had prior knowledge of the 1870s incident before interviewing the Cook County Forest Preserve officers. The 1870s documentation, however, was unable to be recovered in order to verify if the incident had taken place out at Bachelors Grove cemetery or elsewhere. The material is said to be misplaced at this point in time. Some question why a farmer would be plowing near the pond at all, let alone for crops, but there are a variety of valid reasons for plowing in general. Visitors to the cemetery often mention that it would have been nearly impossible to see an object emerge from the water at night from the road. Upon inspection of a scenic photograph from 1979, which happens to be from the same time period, it shows that the height of the road from the pond was around five feet high. Today, the height is only a little greater due to roadway developments, though vegetation growth in the past may have made it much more difficult to view compared to today. Since there is no reference point to the time of year in which the sighting took place, such as Fall or Spring, it can not yet be determined if the vegetation had any significant impact. Years later within the 2004 book Haunted Cemeteries, information surfaced that the horse simply got too close to the water and fell in. Today, you will find people referring to comments from this book in the sense that the horse was not scared but simply tripped and fell in. As previously noted, the 1870s documentation has yet to be recovered so there is no information to substantiate if the event even occurred at Bachelors Grove cemetery, but the research continues. Found within a 2009 report, while driving on the Midlothian Turnpike some time in the early 1990s, Laurie Lambert of Illinois stated "a man driving a horse-drawn cart pulled out in front of me. I slowed down immediately, he went a few feet ahead and turned off the road." She was later surprised to hear of the horse and plow sighting from a speech given by Dale Kaczmarek. Often attached to the legend of the farmer and horse is the report of a two-headed monster. The earliest written reference thus far to the two-headed monster comes from the 1985 book Real Ghosts: Don't Wear Sheets by Don Farrant. On page 61 it states, "and people claim to have seen a two-headed monster crawl from the water up onto the bank. But sometimes, say passing motorists, they have seen a murky monster going back into the waters...and disappearing!" Confusingly, within the 2000 book Windy City Ghosts, it mentions that the legend of the two-headed monster has been circulating since the 1960s. No other information has been found referencing that specific time period. Researcher Richard Crowe of Illinois did state in a 2011 interview that the legend of the two-headed monster was fairly new in comparison to the disappearing house and blue light legends, though he does express his own doubt on the horse and plow sighting. Dale Kaczmarek stated during a 1982 NBC 5 Chicago television broadcast that "what people are even saying is a two-headed monster, which, supposedly crawls out of the lagoon and across the 143rd Street." which may indicate that he has his own reservations to the two-headed legend in particular. 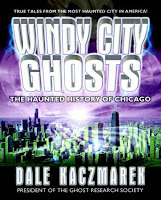 Then on page 86 of the 2000 book Windy City Ghosts Kaczmarek stated,"Surely no one believes in a two-headed monster?" There is a theory that some of the two-headed sightings may have been mistaken for the apparition of the farmer and his horse, hence the reason why both legends are seen as one and the same. It is also speculated that reports of a "black carriage being drawn across the lagoon" could simply be a part of the farmer and horse apparition as well. Another theory as to the origin of the two-headed monster can be found within the 2000 book The International Directory of Haunted Places. On page 179 it states, "during the late 1920s, the site was a favorite dumping ground for victims of Chicago mobsters. Perhaps the unique phantom is a remnant of those violent times." During an interview with Richard Crowe in 2011 he stated, "I know for a fact how the story started," He then goes on to mention that the story of the two-headed monster dates back to the 1970s. It is said to have come from the sighting of a grotesque two-headed feature within a window of a mental institution in the Chicago area. At some point details were altered and the story found itself attached to Bachelors Grove cemetery. Once in a while you will find people joking around that a two-headed man was hidden away by his family and now comes back to haunt the area. Such a tale can be found on page 103 of the 2000 book Ghost Stories of Illinois. 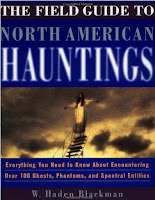 The origin of the story comes from the 1998 book The Field Guide to North American Hauntings by W. Haden Blackman. On page 72 it states, "The grotesque creature wanders between the headstones, often accompanied by a legion of small, dancing blue lights." The author also goes on to state, "His identity is unknown, but he may be the spirit of a deformed man who was kept hidden from society by his parents and secretly buried at the site upon his death." One of the earliest reports of a two-headed monster is mentioned in the 1989 book True Tales of the Unknown: The Uninvited. It tells of an elderly couple driving west late at night on the Midlothian Turnpike. When they approached the pond next to the cemetery, which happens to become 143rd Street at a certain point on its own, they both witnessed movement near the bridge that crosses the creek next to the pond. Shortly after, they each witnessed a "two-headed man" approach from under the south side of the bridge, cross in front of their headlights, and head north into what is now called the Rubio Woods Forest Preserve. They then proceeded to drive faster and left the area. Over a decade later within the 2003 book Voices from the Chicago Grave by Scott Markus, it mentions a man by the name of Adam R. Rotsch. On page 98 Markus speaks of Rotsch as "startled to see what appeared to be a disfigured man walking over the pond." The man is described as having a large bulge protruding from his shoulder. Markus also stated, "While some assumed it was another head, Adam merely thought the man had a hunchback." Rotsch is said to not have had any prior knowledge to stories of a two-headed man. Although his sighting occurred during the late 1990s, no specific details were given on the time of year or which section of the pond it was sighted at.